"Famous in the Low Country of Georgia and South Carolina. This boil is done best on an outdoor cooker. 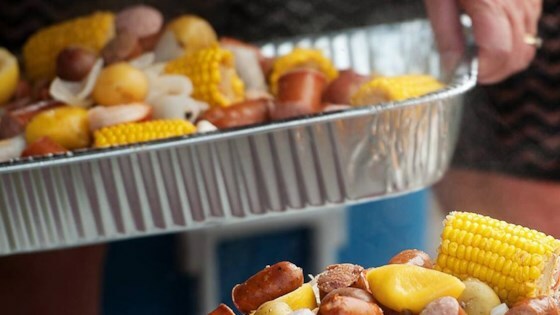 It has sausage, shrimp, crab, potatoes and corn for an all-in-one pot all-you-can-eat buffet!" Heat a large pot of water over an outdoor cooker, or medium-high heat indoors. Add Old Bay Seasoning to taste, and bring to a boil. Add potatoes, and sausage, and cook for about 10 minutes. Add the corn and crab; cook for another 5 minutes, then add the shrimp when everything else is almost done, and cook for another 3 or 4 minutes. Drain off the water and pour the contents out onto a picnic table covered with newspaper. Grab a paper plate and a beer and enjoy! Turn dinner into an event with an authentic crab boil. See how it’s done!